The spray mist is an essential item for your aluminium machining needs. 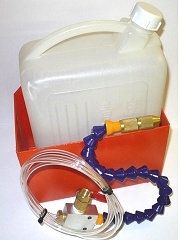 Using the bottle and holder to store the liquid, the bendable nozzle can be secured to where necessary, enabling a flow of liquid from the bottle. The spray mist can be used on saws for cutting aluminium, end millers or routing machines.